"To me, the Philippines is more complex than most people realize, misunderstood because there is a lot that I don't understand, and very rich with lots of potential and beauty. In that complexity, there's so much beauty." You'll find AnneMarie in a loft with giant windows and painted walls. She wants to be surrounded by vibrant colors like royal purple and sky blue and fill her rooms with art nouveau furniture. She'd also like to have a little library with walls covered in bookshelves. Her ideal workspace would definitely be not in a cubicle. She likes co-working spaces because they're good for collaboration. She wants to avoid getting stuck in her own room. She feels especially productive… she's a night owl. She feels most productive from 6pm-2am. Try not to disturb her… when she's really deep into a thought or when she needs "me" time. Especially don't disturb her when she's trying to write. She sees herself helping Kaya Co. grow by… telling Fil-Ams and non Fil-Ams how the fellowship experience has impacted her. When people bring up the PH and ask what she did last summer, Kaya Co. always comes up. She wants to continue giving ideas for the Compass design. When she has more time, she thinks it would be really cool to work full-time for Kaya one day. 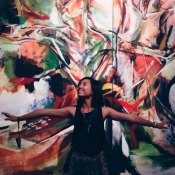 She’d like to grow through Kaya Co. by… learning even more about social entrepreneurship. Learning about the human-centered design process through Kaya Co. made her realize that all ideas are valid. It gave her the possibility of starting her own venture. Kaya has helped build her identity as a Fil-Am while she figures out how my piece of puzzle fits into bigger picture. One thing you should know… She really likes music. She doesn't consider herself a performer, but playing the piano and ukelele are things that she's carried with her throughout her life.